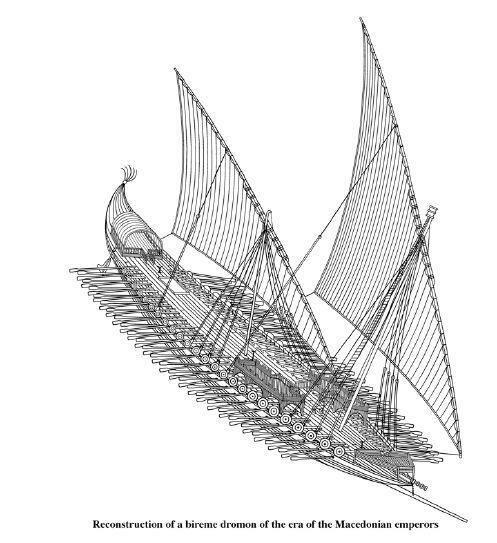 Reconstruction of an early 10th-century Byzantine bireme dromon by John H. Pryor, based on references in the Tactica of Emperor Leo VI the Wise. Notice the lateen sails, the full deck, the fore- and mid-castles, and the Greek fire siphon in the prow. The above-water spur is evident in the bow, while the captain’s tent and the two steering oars are located at stern. This entry was posted on September 20, 2018 at 12:09 pm	and is filed under Uncategorized. You can follow any responses to this entry through the RSS 2.0 feed. You can leave a response, or trackback from your own site.